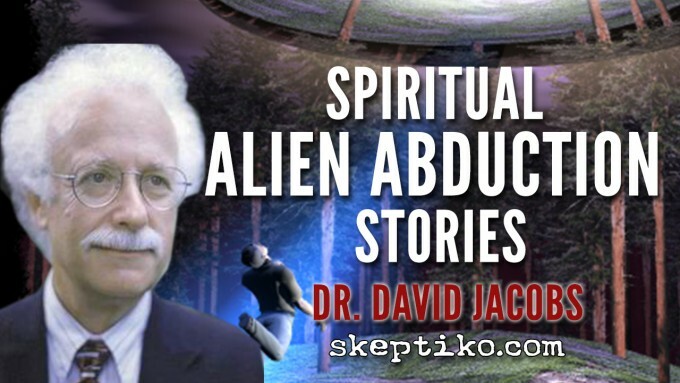 Part two of an interview with alien abduction researcher Dr. David Jacobs examines alien encounters from a spiritual perspective. 1. Does world view matter? Does being a social scientist, or humanist/atheist, and not believing in extended consciousness/spiritual experiences, affect one's scientific approach? 2. Specifically, does that apply to Dr. David Jacobs based on his responses during the interview? I enjoyed both these interview sections and thought Alex badgered away at Jacobs well in trying to understand why this disparity between his abduction clients’ experiences and Mack’s or the other ‘spiritual solution’ researchers. What I’d liked to have heard Alex ask him is, has he studied the transcripts of these ‘opposite’ researchers and can he point to where they ‘ went wrong’ in his view in eliciting a different story. Similarly I’d like to hear the ‘opposite’ researchers discuss the transcripts of Jacob’s work and suggest where he veered off at a materialist, instead of a spiritual tangent. I do agree with Alex that Jacob’s view of spiritual realms does affect to some extent the results he gets – some might argue that a non-belief in spiritual areas might even be an advantage in getting at the truth. I’m pretty sure that’s what Jacobs thinks. I applaud Alex’s suggestion of setting up experiments with common abductees and different researchers to learn stuff but as it doesn’t look likely to happen, all we have is the transcripts and recordings of sessions for comparison. I’m unaware if there is such documentary evidence with abductees common to Jacobs and the other researchers. Of course even if there is a spiritual aspect to any of this, it may not be the purpose or objective of any abduction. It would be like taking an alcoholic through hypnosis. He would relay his trauma and could say that his pain has led him to a deeper spiritual understanding etc. But that might purely be an effect of his drinking trauma and not the reason he was led down the alcohol route. I thought that was great too, but of course we both knew that wasn't going anywhere because of everything that came out after the first part of the interview was aired. Without knowing the additional info about the various accusations against Jacobs, as well as the truth in regards to Mack (provided by a JEMI representative and corroborated by the Vanity Fair article), the Jacobs interview sounds rather promising. But when you know all that stuff, it all sounded rather sad somehow. yea, I'd like to get there too... all this seems doable... but not easy. I don't think the Jacobs protocol is hard to follow... moreover, Mary Rodwell insists that she follows some of the same basic precautions. yea, I know what you mean... there's a little bit of hopelessness in this affair, or maybe just another reminder re the "illusion of control" thing that runs our life. Thank you Alex for asking the tough questions, as always. I'll was hoping to keep this brief, but... Jacob's premise that spiritual transformation is simply not part of the abduction phenomenon perhaps is and is not accurate. His view does however, expose where his research starts and stops. He seems to focus exclusively on the trauma of the 'abduction event' and narrative, and avoids going further to examine a possible long term effect or function. This is where he and Bud Hopkins and John Mack essentially HAD to part ways, as he said. He and Hopkins were rigidly fixed to this reiterating this idea, and Mack, having training in psychology just had to say, ok enough is enough already. I'm sure to some degree just as Hopkins did, Jacobs now attracts and self-selects from a mix of candidates that fit this belief -which is only natural in research. But what's strange is he seems to outright dismiss the implications of not only modern abductee research, but what many abductees have said and published about the experiences themselves - which is the abduction event seems to be just one aspect of a much larger transformational process and phenomenon. There's potential levels to explore in the process. I'm not sure why he dismisses it, but he does. Perhaps his inability to look beyond the trauma may have to do with his attachment to the utility of the hypnotic process -and more importantly promoting his unique methodology, which seems particularly good at uncovering confabulation in these initiatory episodes. He does in this interview reiterate how important his methodological insights are to avoiding the pitfalls that comes with working with abductees. I'd be interested to hear a response from a clinical hypnotist on whether his claims here are grounded or not. good point. the strangeness is challenging and seems to lead to a lot of confusion. the anti-hypnosis crowd throws up their hands and says "anyone who has undergone hypnosis it unreliable" -- that's goofy. then the abduction crowd like Jacobs go with the, "you can't trust any memories because the aliens can implant anything in your head" -- another non-starter. and finally, you have the aliens as angels crowd who seem a little to eager to gloss over some of the nastiness. I have just finished this 2 part podcast and been listening to all the alien oriented podcasts as well as many others in the last few months. Although I've just come to the Skeptiko family this past year. I have been contemplating the nature of existance for the last 50 yrs or so. Starting with rejecting Catholism at the age of 7, Using LSD, Peyote, Psilocybin experiences for spiritual exploration as a teenager, going vegetarian and to India to seek enlightenment and back to Naturalism and exploring quantum mechanics. Read all the books was and even graced with some paranormal experiences. I am aware of my own tenous ability to discern reality. I find I'm pretty well tuned in to the kinds of questions Alex asks and am also intrigued by the very different experiences people relate in NDE's, which I can process. Not so much though, the different perceptions of alien intentions by the therapists interviewed. In spite of the alien abduction subject matter, all these interviews basically bring us back to the nature of consciousness and the depth of bias in shaping reality. What is the role of consciousness in shaping what we perceive. If we look at the dichotomy of these stories within the narrow paradigm of the skeptic, its all self created and bogus. Yet, we continually accept information anedotely from trusted sources. Our justice system is based on empirical as well as anedotal reports. One of my closest friends with his wife and mother-in-law attested to me years ago, an experience while driving, a 100 ft wide silver flying saucer hovered at tree top level 300 yds away across a field. When they flashed their headlights, it drew closer. They turned them off and panicked, even screamed in fright. At that moment the saucer stopped and took off with incredible speed. Did I believe them? How does that change my perceptions about UFO's and my skeptical world view, its a dilemma. Even as an experiencer there are problems, as Dr. Jacobs discovered. We face a similar dilemma with all these varying accounts. What are we inclined to believe if there is no concensus in the anedotal information. As Skeptiko members, I wonder if it's wise to have strong opinion's about something we have no real knowledge. So for the sake of wild speculation, if the basic premise is true. Aliens are here and abducting people. The only natural physical resource they wouldn't get anywhere else would be our DNA. The question would follow what are they doing with it? It doesn't require multiple abductions of one person over a lifetime to obtain the complete DNA blueprint. It would seem that something is being done to the people being abducted. Something that requires a process. Dr Jacobs asserts no spiritual or maturation process of any kind is occurring, in fact these people are being traumatized. The other therapists report the opposite effect. They are reporting heightened self awareness, expansion of psychic abilites as well as having frightened experiences. Budd Hopkins was in the 'nefarious alien' Dr Jacobs camp. Mary Rodwell, (late)Dr Mack and Dr Janet Colli are in the 'spiritual development' camp. What commonalites do we find in all these reported abductions? The Aliens are technologically advanced, may I presume very advanced. They are able to manipulate the very fabric of time and space. Would it be presumptious to conclude such beings would know about the very nature of existance and consciousness. They appear to be sort of the same aliens for all the therapists. They only communicate telepathically. The abductees receive memory screens which must be teased apart. people are being abducted multiple times. Even Dr. Jacobs reports an attempt by these aliens to calm people down and even some display of humor. These people are always returned to their prior environment and some sort of communication is intermittenly maintained. The one thing I find intrguing about these creatures is they have a head and 4 limbs and stand upright. Even though there are different species reported they are all humanoid in general shape. I find that peculiar considering the evolution of man from ape seemed environmentally driven to the African Savannah of a few million yerars ago. Welcome to the forum Dmitch - I had to consult the map to discover your hometown is in Hungary! Your summary of all this and your thoughts are similar to my own. Like so many aspects of the paranormal the more one discovers, the less sense it seems to make which moves one to the opinion that we are either all crazy or the universe is stranger than we can imagine or comprehend at this stage in our development. Of course there are myriad theories to answer each anomaly and one answer I've heard to your 'head, four limbs and upright' question is that our visitors are time travellers from our future returning to collect DNA which has developed a problem in their civilisation. But these kind of answers are rather like a religion which throws out God as an answer to everything. If all this is not conjured up by ourselves as a kind of consciousness matrix, and there are really aliens, then one thing's for sure - they're secretive little fellows and don't plan to explain what the heck is going on anytime soon! 1. That an alien being (discreet entity) brings a subject on board a craft through advanced technology (although the surical instrument the abductees describe seem kind of primitve) and the Jacob type scenarios unfold. 2. Another approach could be: some spiritual evolutionary force that exists in one’s psyche as well as in the collective unconscious, constellates an archetypal process which unfolds and connects the individuals consciousness with a Higher more collective intelligence. This process could be related to how myths emerge from the culture (ala Jung/Campbell) or a great work of fiction or art which conveys the collective truth far better than recounting history. In this abduction image the personal ego is suspended and the person experiences themselves in the narrative which is guided by this uber intelligence or Higher Self (from which our individual small s self or ego is derived). This type of archetypal phenomenon can be seen at times by multiple people, as in Marian apparitions. From what I remember from Macks passport book and his interviews, the aliens were at times initially cold and menacing but over time through repeated abductions, went through a kind of evolution where they became more related and conveyed the sense of a mission to bring awareness to how we are destroying this sacred planet of which we are a part. I don’t have the book now and can’t remember exactly how prevalent this type of scenario was but it seemed significant. Anyway, it could be that Jacobs clients never progress through this process and remain stuck in the initial phase perhaps in part because of Jacobs limited materialist approach which reduces the possibilities to some literalist scenario. Likes: GJ Gaura and K9! In this abduction image the personal ego is suspended and the person experiences themselves in the narrative which is guided by this uber intelligence or Higher Self (from which our individual small s self or ego is derived). This type of archetypal phenomenon can be seen at times by multiple people, as in Marian apparitions.. It's worth pointing out that fairies have not always been figures with wings that flit from leaves to trees, to lily leaves on ponds, waving wands and shining brightly. In early folk fairy lore - and remember fairy lore has been with us for hundreds and thousands of years - the fairies were often highly unpleasant. They'd steal children. They'd abduct people from quiet country roads. And they'd return them often days, weeks, months, years later...These people having no recollection of any missing time at all. Fairies were enchanters, fairies were deceivers, and the very word "fairy" refers to the sort of enchantment spell they cast over people. I perused the video really quick. It looks great - I'll watch it later. I would think Patrick harper, who wrote daemonic reality, would be mentioned somewhere in there. Btw It doesn't seem like this approach got much traction on this form in the past but for me it seems like the most explanitory. I think people get stuck in the Victorian idea of fairies, which the documentary explains as an attempt by Victorian Society to take the venom out of reports of such experiences. The Victorians made fairies into child's play. But now those stories have resurfaced as alien abductions... which we've turned into ET. That might sound like a leading question because I didn’t say, “Is he on top of you or on the bottom of you,” but that’s a nonsensical question. He’s got to be somewhere. Is it bright or is it dark or is it dim? Not quite -> What's the light level there? Are they wearing their clothes or are they not? I think "what are you wearing?" What happens next? They go down a hallway and they go into a room or whatever it is. Then what happens? And then there’s tables.
. At the same time, I will ask purposely misleading questions to see if these people will be led. This is especially true for the first and second sessions, to see if they’ll take the bait. I won’t go into all the tricks of the trade but I will do other procedures and try to lead them off the track. I try to get them to obey what I’m saying as opposed to what they’re actually seeing. Seems like a valid - if icky - way to establish that the person isn't just being led. I'd like to see Jacobs and Ardy Sixkiller Clarke team up on some research. But now those stories have resurfaced as alien abductions... which we've turned into ET. There are still many people who have interactions with fairy. It seems otherwise because the number of people documenting or researching ET related stuff is much larger. Yes there is some shift - many people who now identify a presence as an ET where before they may have thought fairy or demon. However I see distinct differences. ET encounters often involve tech of some kind. Fairy, demon, fae encounters do not. To Psiciops and Larry, I like the time travel scenario, but the hitch there is why the life long occupation with the abductee? Another hitch is chaos theory excludes the kind of time travel were talking about. The other scenarios don't adequately incorporate this aspect of the phenomenon. Since this is all speculative, I dare not criticize, but fairies don't cut it for me. Just too speculative. Although there's some famous group eye witness accounts that go back to the 15th century and that Madonna painting by Ghirlandio. Yes, there's even a very famous chronicle with Alexander the Great. Another aspect that seems to be prevalent is different looking beings. I'm back to advanced beings warping space from another star system. all these interviews basically bring us back to the nature of consciousness and the depth of bias in shaping reality. What is the role of consciousness in shaping what we perceive. The only natural physical resource they wouldn't get anywhere else would be our DNA. sounds reasonable... but I just don't know. what about all those cattle mutilations? as you allude to above, we have to accept that this extended consosiness stuff is just kinda strange... e.g. why do some people who expeirnece a NDE have incredible clarity... receiveing answers to any question that pops inot their head... even in subjects they know nothing about -- and, at the same time, have wildly different reports about the "reality" of the other side?